I loved Scarlett! She had some sass and she is smart as can be. We begin right in the action which honestly is not always my favorite. 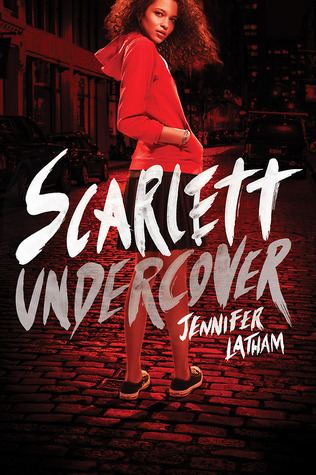 Scarlett is a 16 year-old high-school graduate and instead of looking ahead to college she’s working as a private detective. Her parents have died and she lives with her older sister who is crazy busy in medical school so Scarlett is largely left to her own devices. Our investigation begins when a young girl comes to ask Scarlett to prove that her older brother didn’t kill himself. I did spend some time during the first third of the book wondering why exactly Scarlett got to be a teen detective– but when the explanation came clear I found myself nodding along at the book. Yes a bit of suspension of disbelief, but it worked for me. It was refreshing to read a book about a character who was so very different than your usual YA! Scarlett is Muslim, but that’s just one facet of her. She’s as conflicted about her obligations to religion as nearly any other teenaged girl. She wants to listen to her older sister who is responsible for her, but also chafes at following rules. Also, yay for some teenage romance that doesn’t dominate the book! Scarlett has a crush, she acts on it – but that’s not the end all and be all of her life then. She doesn’t drop everything to listen to a boy. There’s a suggestion of magic to the plot, but not this was definitely a mystery – not a fantasy novel. Scarlett believes some day she can figure out why her father was murdered, even if the police have given up. I loved that Scarlett was brave and determined, but not unwilling to ask for help. She is sarcastic and funny even when she’s in over her head. This was a really fun young adult debut and while there is no sequel planned right now I really hope to catch another case with Scarlett! Thank you Little, Brown Books for Young Readers and NetGalley for this advance copy in exchange for an honest opinion! Holly and I are posting today on The Bubblebath Reader and will be all month about Lauren Willig’s The Garden Intrigue! Stop by!